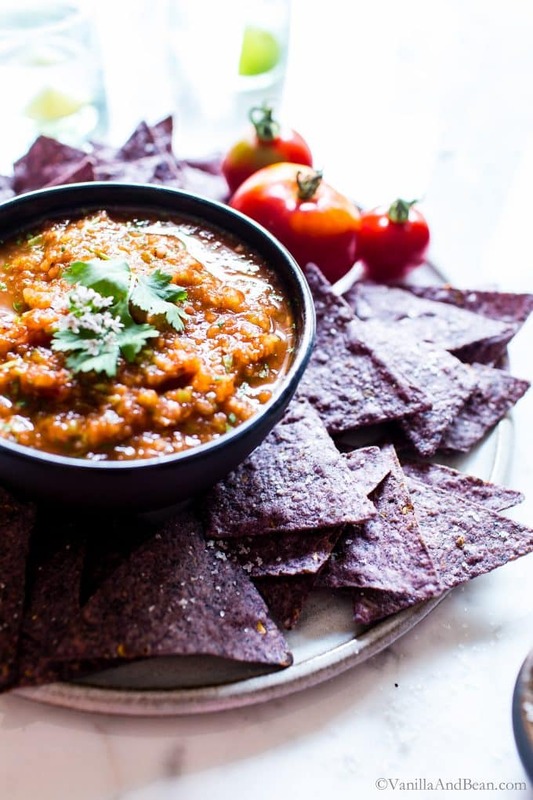 I started making homemade Mexican red salsa when my cousin shared this mouth-watering chipotle salsa with me so many years ago. I had a habit of simply buying red salsa from the store. But after she showed me how easy it is to make homemade, and also, when I tasted it, I knew I had to start making my own. With a rough outline of the ingredients, I started playing with the proportions of jalapeños, chipotle peppers, adobo sauce and onions to see what I preferred, and to tone it down a bit when needed. I’m reminded that some prefer a mild red salsa over a fiery chipotle hot salsa recipe. 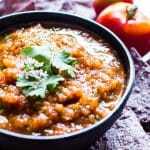 What Ingredients are in Mexican Chipotle Salsa? Chipotle chilis in adobo sauce freeze with ease. 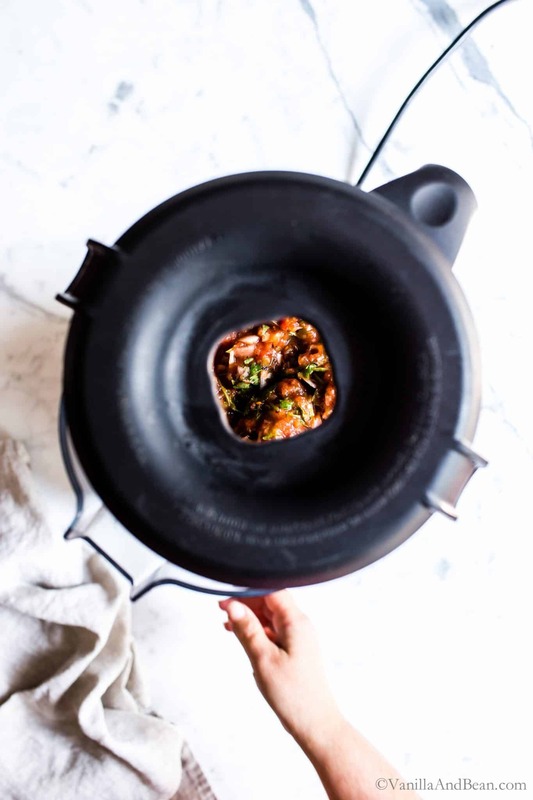 After opening a new can, pop the leftovers in a lidded glass jar and refrigerate for up to a week or freeze the chilis for up to two months. How do you Make Mexican Chipotle Salsa? This is such a simple recipe. All you need is a blender and the ingredients. 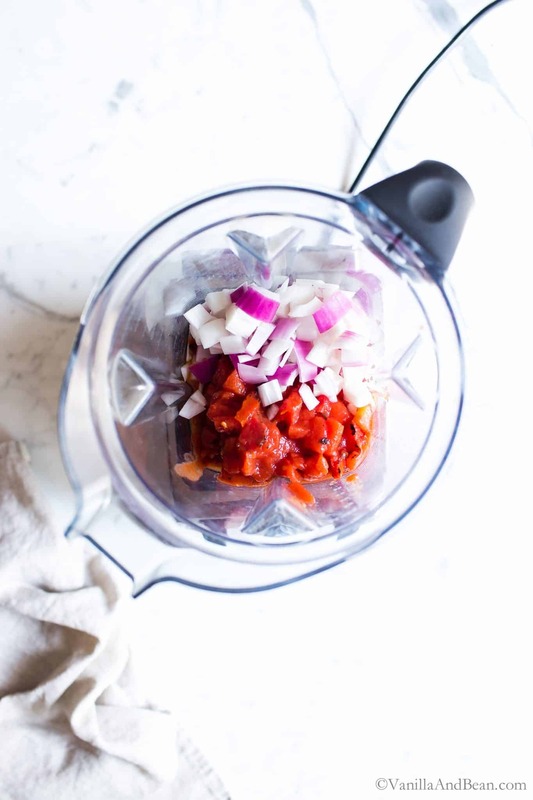 First, layer the ingredients into a blender: tomatoes, onion, bell pepper, cumin, chipotles and adobo sauce, jalapeños, garlic, lime, cilantro and salt. Next, pulse until desired consistency. For a chunkier salsa, pulse only a few times. For a looser with smaller chunk salsa, pulse longer. Last, taste for salt adjustment then pour into a lidded storage container. Refrigerate for at least an hour before sharing to let the flavors marry. As written, the recipe makes a mediumish Mexican chipotle salsa. For a hot chipotle salsa recipe, increase the chipotle pepper, adobo sauce and jalapeños. For a mild salsa recipe, reduce the chipotle, adobo sauce and jalapeños. I’ve included further details in the recipe. Mexican Chipotle Salsa lasts for about four days in the refrigerator. Store it longer and it starts to sour. 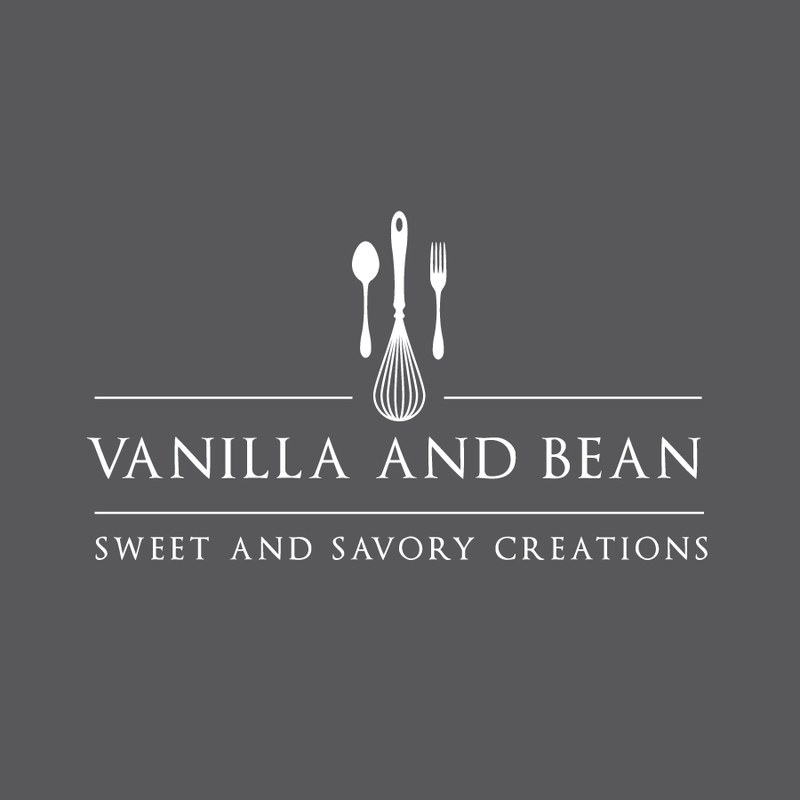 I find this recipe isn’t freezer friendly, so make it fresh and enjoy it! 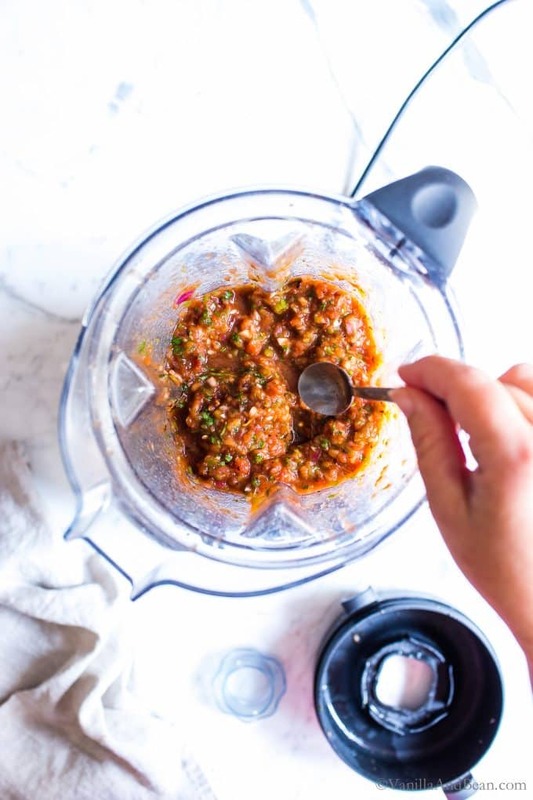 The beauty of homemade salsa is you can completely adjust it to taste. Start out with a mild, medium or hot salsa, see options in the recipe, and take it from there. Take the heat up by adding more jalapeños or chipotles. Need more smoky flavor? Add a bit more adobo. More freshness? Add a few more sprigs of cilantro! Too acidic? Add a pinch of sugar. Freezer friendly? I prefer this salsa made fresh and only stored in the refrigerator for up to four days. After that it begins to sour. Can I double the recipe? Absolutely! I do this quite a bit when making a Mexican food feast. 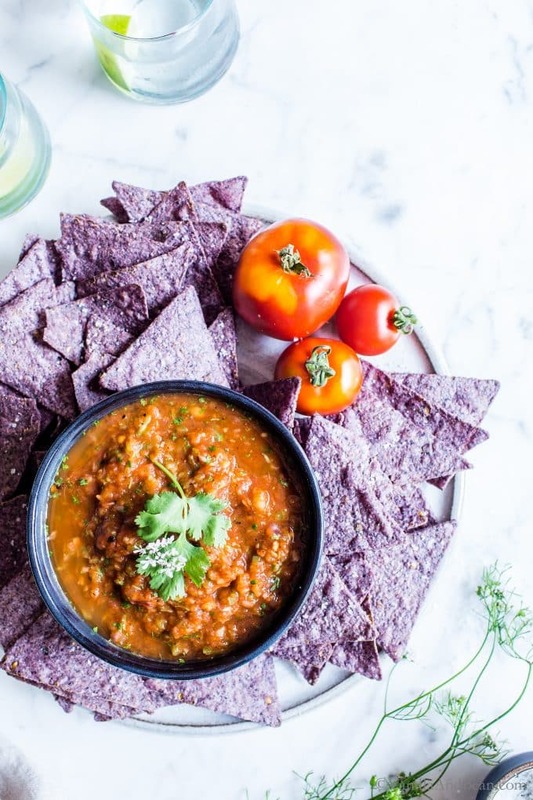 Vegetarian Mexican Food to Share this Red Salsa With! In the pitcher of a blender, layer in the ingredients: tomatoes and all their juices, onion, bell pepper, cumin, chipotle chili, adobo sauce, jalapeños, garlic, lime, salt and cilantro. For chunky salsa, pulse only a few times. For a thinner sauce, pulse longer. Pulse until desired consistency is reached. Adjust salt to taste. Pour into a lidded storage container. Refrigerate for at least an hour before sharing to let the flavors marry. Refrigerate for up to four days. Prepare recipe as written, but add an additional 1/2-1 Chipotle pepper and 3 tsp of adobo sauce. Add a few more jalapeño pepper rings to taste. Prepare the recipe as written, but use only 1/2 a chipotle pepper, 1 tsp of adobo sauce and 0-2 pickled jalapeño pepper rings. *For a looser salsa, use crushed fire roasted tomatoes. It's not as chunky as diced tomatoes, but makes a fine salsa. **Red/purple onions tend to be spicer than white, so for a milder salsa, go with white onion. 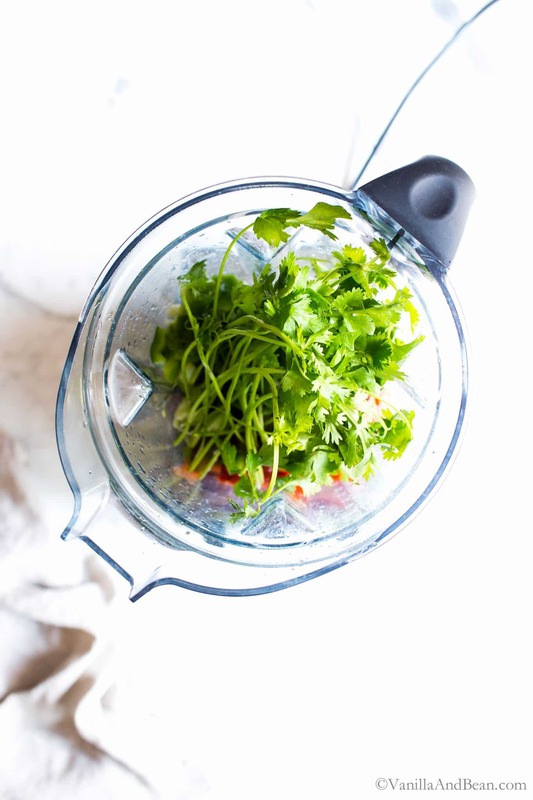 ***If not much of a cilantro fan (some say it tastes like soap) only add a few springs. I add a lot, because I love it. But the amount is completely to taste. Play with it and see what you like best! I have not had a lot of luck with blender salsa in the past, Traci. It always comes out kind of watery and a bit bubbly from the air that gets mixed in. I think I may be adding too much liquid or blending it too long. Will try you recipe – because yours looks like it has the perfect texture. And I like that you are giving two versions – I’m a mild salsa fan! Hooray for blue chips! I hope you’ll give it a go! I hope you enjoyed the salsa, Arthur! I cannot wait to make this for Tom! I think he could live on chips and salsa alone Traci! And he’s quite the taste tester. He’s always up for a new verion. I’ll keep you posted! Ohhhh.. I hope he likes it Mare! It’s such a great snack. Hi Sarah! That’s so fantastic you’re growing your own. Making salsa with fresh tomatoes is my favorite, of course. Like you, I can’t wait for summer tomatoes! But when they’re out of season, this is my go-to! Oh my goodness! My son Nick will love me for this!! These are the flavors that he goes for every time!! Delicious, my friend! I hope you and Nick love the recipe, Annie! I think once you make homemade salsa, you can never go back. It’s so good and easy! I love the adobo sauce in here. I always have that on hand. Definitely will try that next time! I couldn’t agree more, Liz! Adobo truly elevates salsa… IMHO! Hope you enjoy it Liz!